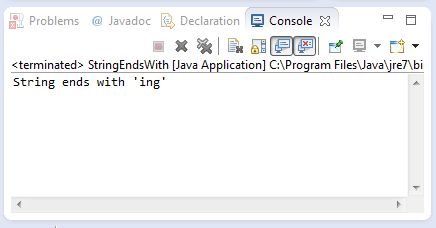 This java tutorial shows how to use the endsWith() method of java.lang.String class. This method returns booelan data type. The endsWith() method of String class generally checks if the end of the String is equivalent to String suffix method argument. This method returns boolean. Method returns true if the character sequence specified on our parameter matches the end characters of our String. This example source code demonstrates the use of endsWith() method of String class. Basically this source code just check if the String ends with our suffix method argument.